Berry and lemon just always seem to go together to me in desserts. It's such a lovely sweet and tart combination. This cake is always fun to look at when you cut it, of course then you eat it anyway! Pastels are always associated with spring and Easter so this cake looks like a nice spring treat. The pink can be any type of berry flavor, I used blackberry extract. I will say I think this cake looks even cooler with more layers, but not to many. I could have done with maybe one more of each color. If you want to achieve that just double the cake batter then you will have thicker layers to cut :). This cake actually doesn't take to long to make because it's all about how you cut the layers then put them back together. I tried my best to explain the process and I should have taken pictures but I haven't make this cake in years so I wanted to make sure I got it right. If you have any questions please feel free to ask. Another thought I had was to mix some pureed fresh berries into the frosting that will be used to fill the cake (but not nice it) and that would add some more flavor and color as well. But, it would need to be pureed though and not big chunks for the design to work as well. Of course, if you just do layers then your fruit can be as big as you want :). One hint of advice, when you layer it do - yellow, pink, yellow, pink. I didn't think it about it and did it the other way and when I flipped it obviously my pink was on the top and the yellow was the top of the curve. Oops. If you start with yellow then you will have the pink on the top of the curve and the cake will be better defined. :). Happy Baking! 1. In a large mixing bowl, cream butter with sugar until fluffy, about 5 minutes. Combine the flour, baking powder, and salt; add to creamed mixture alternately with water. Beat just until combined. 2. Divide the batter evenly between two small bowls. Mix berry extract and pink food coloring into one and lemon extract and yellow coloring into the other bowl. Stir until combined. 3. In another mixing bowl, beat egg whites on high speed until stiff peaks form; divide in half and fold into each batter. 4. Pour into two greased and floured 8” round baking pans. Bake at 350 for 21-24 minutes or until a toothpick comes out clean. Cool for 10 minutes; remove from pans to wire racks to cool completely. 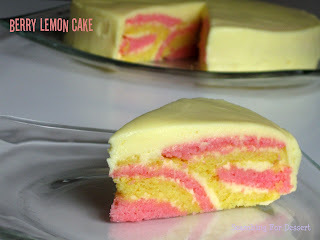 Slice each layer into 2 horizontally. 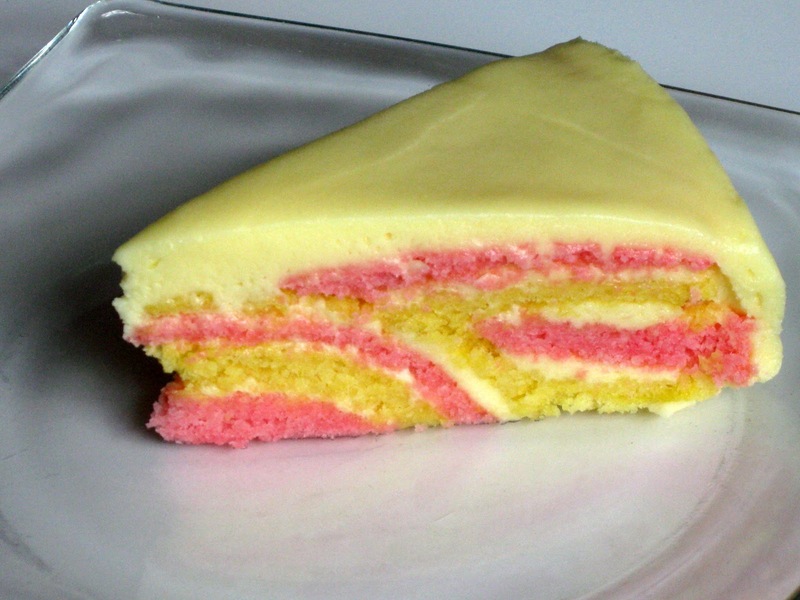 With alternating colors stack cake on plate with a thin layer of frosting in between. Frost exterior of cake. 1. In a large mixing bowl, beat butter, powdered sugar, and extract until light and fluffy. Add enough milk to achieve frosting consistency. Add food coloring if desired. 1. 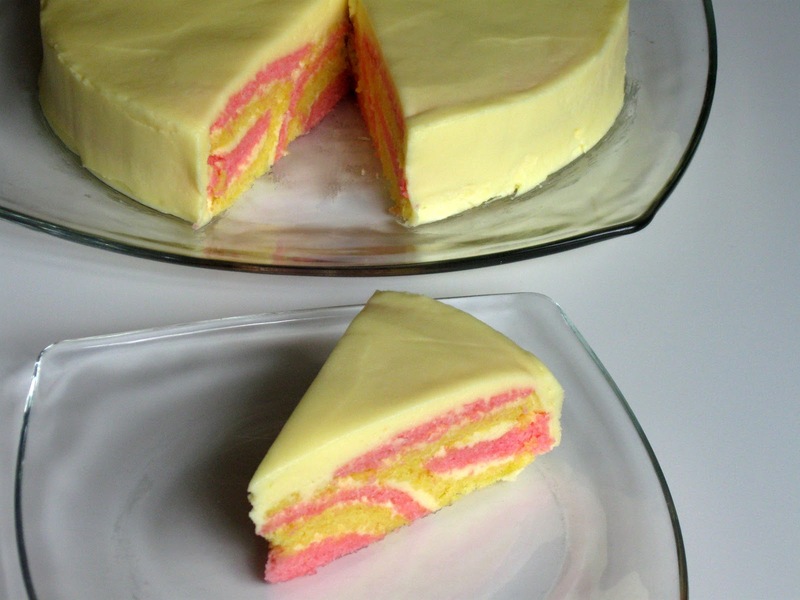 Once the alternating layers are stacked with a thin layer of frosting in between place cake in the freezer for 20-30 minutes. 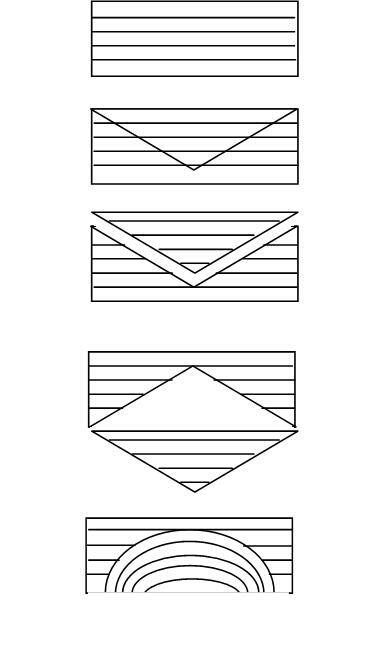 Use a knife and cut an upside down cone shape out of the cake, leaving about 1” around the edges on the top of the cake. 2. Gently remove the cone from the cake. Place the cone point down onto the plate. Gently flip the outside ring of the cake over so that the bottom of the cake is facing up and place the cake over the inverted cone. Press the cake lightly but evenly so that the top is smooth enough to frost. 3. Frost cake as desired. Sometimes I post to linky parties which are all filled to the brim with awesome ideas so you should check them out :)! What an amazing looking cake!!! I love how it turned out!!!! Not only does it sound delish, but it's gorgeous! Great job! Thanks Aimee :) I appreciate you stopping by! That is unbelievably gorgeous! Stopping by from Trick or Treat Tuesday :) Pinning to share. When I was looking at your orange curd cake, I saw the link to this one and HAD to come check it out. Must make this! I don't have a video but I added a picture representation at the bottom of the post that will hopefully help with the visual aspect of assembling the cake.